Nurses and teachers are on the frontline of the battle to transform the Ugandan village of Kabubbu which was so destitute and devastated by disease that villagers called themselves ‘The Forgotten People’. Now, through the Quicken Trust, they have hope and the prospect of supporting themselves in the near future. The staff who work for the Kabubbu Development Project in the Kabubbu Parish Health Centre or the primary school or Trust High Schools come from outside Kabubbu. Many have come from Kampala – swapping the cosmopolitan capital city for a rural backwater with dirt track roads and basic facilities. The KDP believes it is right to honour their commitment and love by providing homes for its staff. Commuting from Kampala would be too costly. 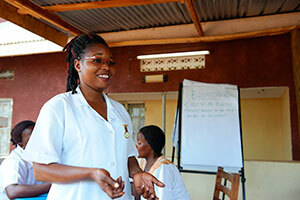 By sponsoring staff, Quicken supporters are also honouring teachers and nurses. Staff at the Health Centre see 13,000 patients a year. Their work is transforming healthcare in Kabubbu. Having trained midwives on site means the risk of dying in childbirth has dropped dramatically. Immunisation is cutting disease and campaigns such as AIDS education have given hope to those living with HIV. Backing a nurse gives practical support – and sends huge encouragement. Click here to find out how you can start sponsoring a nurse. The primary school and Trust High School have quickly established high standards. Orphans from Kabubbu are now attending university – something unimaginable a decade ago. Many more are in vocational education with the prospect of an income at the end of it. News of the schools’ reputations has spread – hundreds of parents from Kampala and further afield are sending their youngsters to board at the Trust High School. The excellence is due to the hard work, love and commitment of the KDP staff employed as teachers. They are producing an educated generation and bringing hope to Kabubbu. Backing a teacher salutes their achievement and sends encouragement too. 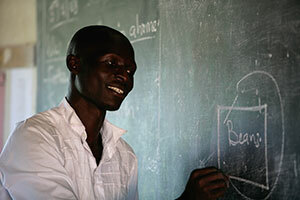 Click here to find out how you can start sponsoring a teacher.